Seeing very green indeed, looking at those pictures, it's going to be superb! Wow! Looks great!! 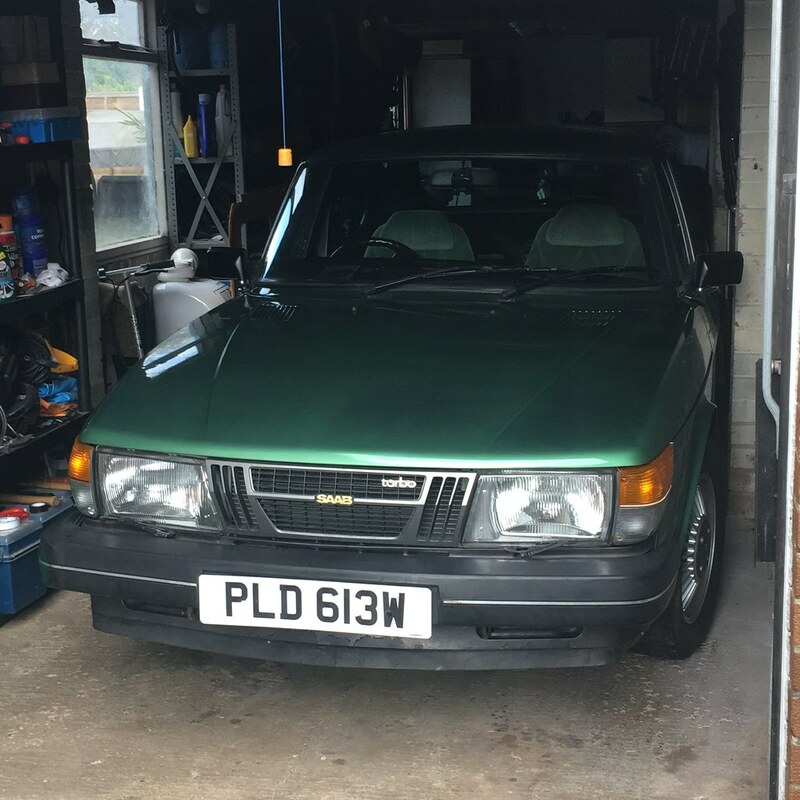 I'm transported back to 1981 when my Dad bought BUJ41T, our Acacia Green 79 5-door turbo. Well things haven't worked out as I hoped and the end result isn't up to a good standard. The problem seems to have come from the choice of paint. I gave the paint-shop the original acacia green paint code and when they contacted the paint supplier they were told that it had never been converted into a clear over base modern type paint system. 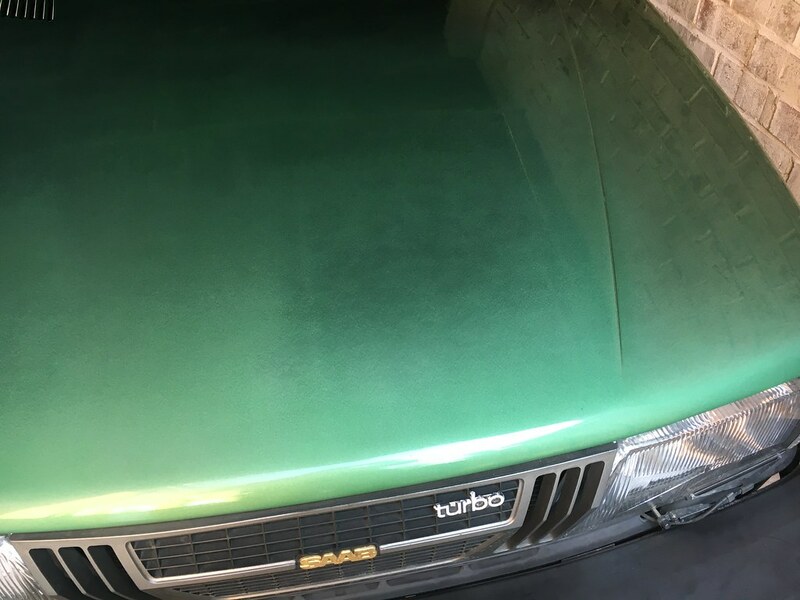 Saab probably made the last Acacia green car in about 1981. Unfortunately (and hindsight is just a fantastic thing) the paint-shop decided to go with the 40 year old paint type in two pack which is a single metallic gloss paint without a top lacquer. Clearly we should have got part of the car to the paint factors and had it put on a spectrum analyser to get a clear over base formulation. Get the car in the sunlight and the whole thing is very patchy with dark and light areas (I'm guessing from which way the metal flake is laying). In order to try and get a gloss finish from this type of paint the thickness has varied and there is too much evidence of rippling. The body shop have responded well and agreed to redo the whole car in a modern paint system. So all being well and they are good to their word I'm waiting for a date. Bit miserable ! Don't want to go into the garage at the moment. Last edited by JonBentley on Sun Mar 03, 2019 6:07 pm, edited 2 times in total. That's a shame but sounds like it will all work out, hopefully. Have to use the extra time to track down more shiny new bits for when you put it back together!! What a shame. It looked a cracking colour in the photos. I second some buying shiny bits therapy. The cars now stripped backed at the paint shop for its second respray using a clear over base modern type paint system. Fingers crossed this time that its right - should be getting it back early April (ish). Starting to feel more cheerful especially as it has now grown the front air dam / skirt off a 1981 car. This will get repainted grey at the same time. Was hoping to get it back yesterday but went to see it anyway (as I'm missing it) and its been block flatted and is awaiting paint. I'll be quite cheesed off if its not ready for pickup this coming weekend. Knowing my luck it will be the perfect paint job in the wrong green! Just purchased the grey head liner material (claimed to be as per original Saab) and tin of high temperature glue off Woolies which will keep my mind off the car itself if it drags on further. At least I'm making preparation for its return - makes me feel better. I'm now absolutely certain that the turbo is over-boosting and I'll need a new diaphragm which JamSaab have in stock. I can live with that though for the time being as it won't stop me getting around and about. Providing all goes well with the paint this time its well on the way to being good enough for a show or two this summer. Got my eye on Castle Howard for fathers day. Thanks for asking and I'll post photos of what I get.